Also known as the seladang or the Indian Bison, the Gaur is a large bovine animal found in the forests of South Asia and South East Asia. However, the largest population of gaurs are in India. 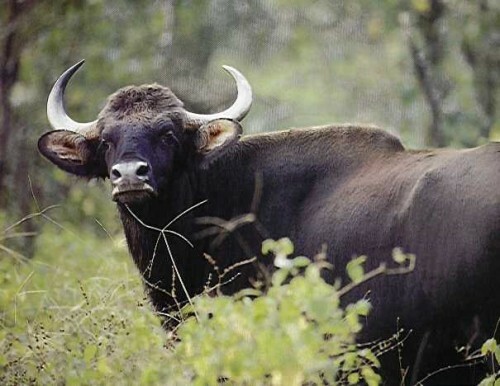 The gaur’s claim to fame is that it is the largest species of wild cattle, including the extinct Aurochs (ancestor of the domestic cattle), African Buffalo, Bison, and Wild Water Buffalo. 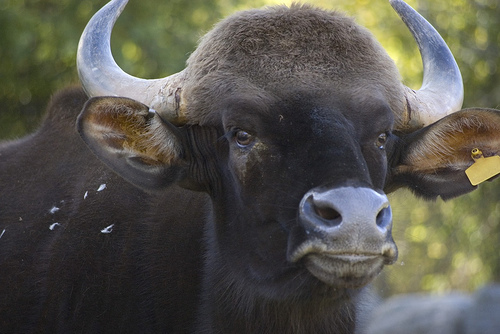 Other claims to fame of the gaur include being the first animal to have give birth to a successfully cloned animal that is an endangered species. This occurred at the Trans Ova Genetics lab in Sioux Center, Iowa. In this case, the cloned animal had a surrogate domestic cow mother. Although it was healthy at birth, it died within 48 hours due to dysentery which may be unrelated to cloning. They look similar to a water buffalo from the front, and from the back it looks like domestic cattle. Other than being the largest of all wild cattle species, it is also the heaviest and most powerful. In fact, it is considered one of the largest living land animals – only hippos, rhinos, and elephants grow larger. Male gaurs are quite imposing as they have a highly muscular structure, a distinctive dorsal ridge, a big dewlap, and a pronounced shoulder hump. Females look much smaller especially since their dorsal ridge and dewlap are smaller. 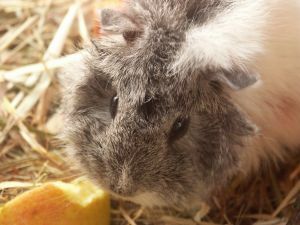 They have a dark brown coat which is dense and short, and the dewlap under the chin extends between the front legs. 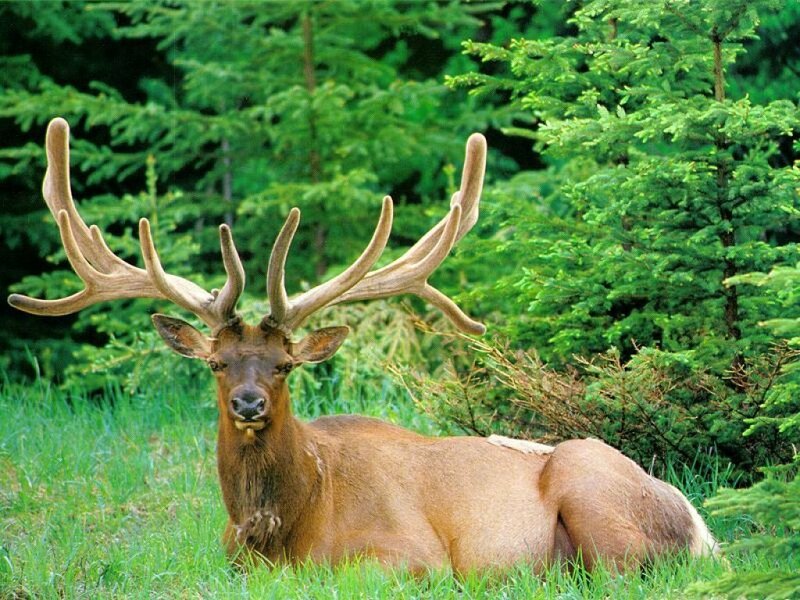 Their horns, which are found in both genders, bend forward which causes a deep hollow profile in the upper portion of their head, with a prominent ridge at the back. Their ears are huge, and the tail reaches the hocks. Wild gaurs are herbivores, as they feed mostly on grass, herbs, trees, and shrubs. They spend the majority of their day feeding except during the hottest time of the day where they lay down under the shade of large trees. In the months of January and February, they live together in small herds of up to 8 or 11 gaurs. One of them must be a bull. In April or May, more bulls may join the herd for mating purposes, but some bulls move from herd to herd mating with many cows. In May or June the bulls leave the herd to either live alone or with other bulls. No one herd has an exclusive home range, and sometimes other herds of up to 50 gaurs or more congregate together. As they are large and powerful, the gaur has few natural enemies. The only enemies it has are saltwater crocodiles, leopards, and dhole packs – but they only attacked unhealthy animals or unguarded calves. Only the tiger has been brave enough to kill a full grown adult gaur. On the oher hand, many gaurs kill tigers especially in battle.